Catch a wave and read the latest news and views from life at sea on cruise ship vacations by syndicated columnists Jim and Barb Fox. Greetings to the many thousands of readers the past month from across the United States, Canada and the United Kingdom as well as Russia, France, Germany, Japan, China, India, Hong Kong, South Korea, Vietnam and Australia. MIAMI (May 26, 2016) – For those looking to unwind and relax, the new Carnival Vista has a lot to ahhh about. The luxurious two-level Cloud 9 Spa features an array of chill-worthy amenities, including Carnival’s first infrared sauna and Hammam Chamber, as well as special “experience showers” that provide a soothing fragrance element, a large heated whirlpool, four steam chambers and a high-tech indoor cycling studio. Carnival Vista – the line’s newest, largest and most innovative ship – debuted earlier this month in Europe. Exclusive to Carnival Vista is the Infrared Heat Chamber. The chamber’s heating system is built into the walls with 80 percent of the heat gently warming the body and the remaining 20 percent of infrared heat released into the air, providing cooler, more consistent temperatures than traditional saunas. The beneficial effects of a sauna remain the same: body detoxification to increase energy, burn calories, decrease inflammation, relieve pain and improve blood circulation in the skin to enhance delivery of oxygen and nutrients. Another Carnival Vista exclusive is the Hammam Chamber, developed during the Ottoman Empire as a place of regeneration, contemplation and inner peace. 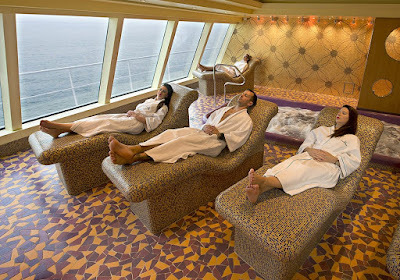 The aim is both physical and spiritual cleansing, along with loosening of joints and muscles by ladling warm water over the body to slowly increase temperature to approximately 113 degrees F.
Carnival Vista’s Cloud 9 Spa also features an elaborate Thermal Suite, which offers intensive relaxation and a new sensory experience provided through individually designed heat therapy rooms that cleanse, tone and purify the body using alternating dry and wet heat chambers. The thermal suite is an exclusive facility within the spa offering different areas for specific therapeutic needs. The Steam Chamber with Aroma Steam and Aromatic Grotto is a small, intimate chamber where high humidity and radiant heat create a moist, warm climate that gently but thoroughly cleanses the skin and respiratory tract with herbal steam featuring sweet aromas such as cinnamon, orange or apple. The Dry Heat Chamber, or Laconium, is a large dry heat bath/sauna-like chamber where circulation is stimulated, accelerating and mobilizing the body's own defenses, while reducing stress. Carnival Vista’s Cloud 9 Spa also has a fitness center with the latest cardio and weight-training equipment catering to all conditioning levels. The fitness center serves as the location for a wide range of instructor-led exercise classes, including a new indoor cycling studio. Powered by Myzone, RYDE is a 45-minute indoor cycling class that takes riders through a series of climbs and sprints to target all energy systems, while integrating technology to track riders’ intensity and enhance their future workout results. The combination of modern and old school music fuels the atmosphere for an upbeat high energy work out that leaves riders with a feeling of achievement. Additional Cloud 9 Spa amenities include treatment rooms for European-style massages and facials, two saunas (men/women), two locker rooms (men/women), a post-treatment relaxation room where guests can lounge, enjoy herbal tea and relish the sensation of pure relaxation and a VIP treatment room with whirlpool. As part of the Cloud 9 Spa located forward on decks 12 and 14, Carnival Vista features 98 spa staterooms and six spa suites. Guests in these accommodations have convenient access to the spa and are eligible for exclusive spa packages, discounts and priority spa appointments. These staterooms and suites have additional in-room, spa-related amenities and décor different than other accommodations, in harmony with the soothing and relaxing theme of the Cloud 9 Spa. A salon with full hair and nail services, men’s barber/grooming area and special stations for manicures and pedicures round out Carnival Vista’s Cloud 9 Spa services and facilities. Carnival Vista debuted May 1 and will operate a summer schedule of Mediterranean cruises through October. The ship will then reposition to New York for a pair of 11-day voyages in November 2016 before launching year-round six- and eight-day Caribbean cruises service from Miami later that month. For additional information, contact any travel agent, call 1-800-CARNIVAL or visit carnival.com. Carnival, a unit of Carnival Corporation & plc (NYSE/LSE: CCL; NYSE: CUK), is "The World's Most Popular Cruise Line®" with 25 ships operating three- to 16-day voyages to The Bahamas, Caribbean, Mexican Riviera, Alaska, Hawaii, Canada, New England, Bermuda, Australia, New Zealand and the Pacific Islands. The company currently has an as-yet-unnamed 133,500-ton ship under construction and scheduled to enter service in 2018.